Patatas bravas, also called patatas a la brava or papas bravas, is a dish native to Spain, hailing from Madrid, often served as a tapa in bars. It actually means “brave potatoes”! 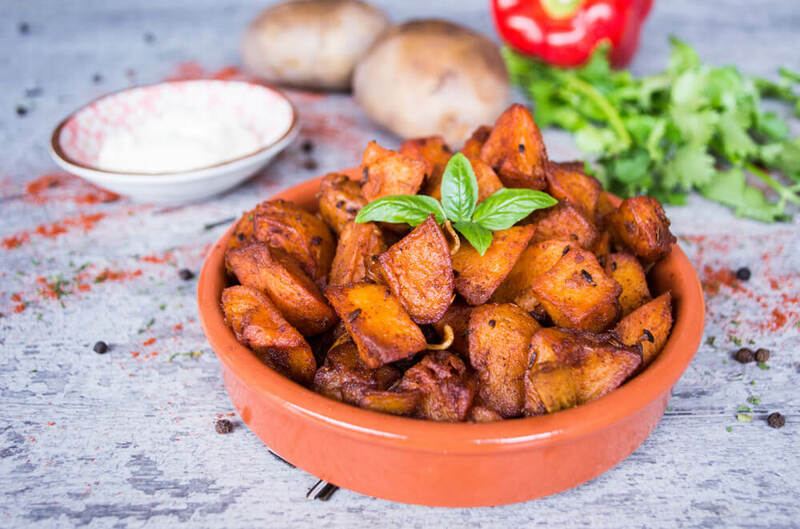 It typically consists of white potatoes that have been cut into irregular shapes of about 2 centimeters, then fried in oil and served warm with a sauce such as a spicy tomato sauce or an aioli. Preparation of the accompanying sauce varies by city. In Burgos, the sauce is tomato-based, and also includes vinegar, red pepper, and a variety of spices which give it bite. In Valencia and Catalonia, the potatoes are covered in a sauce made of olive oil, red pepper, paprika, chili, and vinegar. In these areas, the dish is traditionally served alongside aioli. This is another one of my SouperchefannatravelsxSpain inspired recipes, made healthier and uses sweet potatoes instead. For a healthier version, have the sweet potatoes roasted instead. 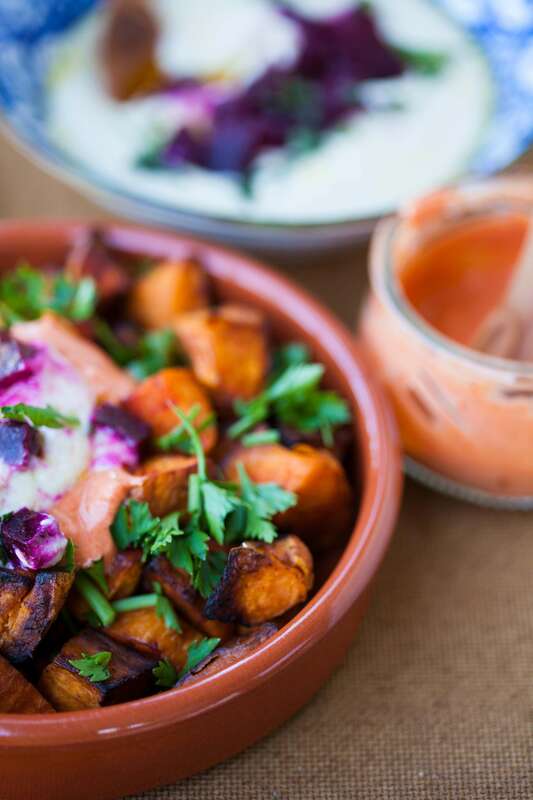 When I made this dish in Andorra, the place we stayed did not have an oven hence I just parboiled the sweet potatoes in boiling water before sauteeing them. I made changes to the sauce and used a smoky sweet paprika mixed with garlic and yoghurt instead of the traditional aioli. Parboil the sweet potatoes in salted water over medium heat for 10-15 minutes or until they start to get tender but still hold their shape. Drain in a colander and leave to steam dry until cool. Heat up a large non stick frying pan with olive oil. Once the oil is hot, add the potatoes into the pan and cook for around 8 minutes, turning occasionally until all golden brown. Turn down the heat if the oil becomes too hot. Add garlic and rosemary leaves when the sweet potatoes have all become golden brown. The fresh herbs make a bright and earthy finish. Drain the sweet potatoes on a plate lined with paper towel to absorb excess oil. Scatter the toasted fennel seeds, paprika, chopped parsley leaves or coriander leaves, salt and toss together until well coated. 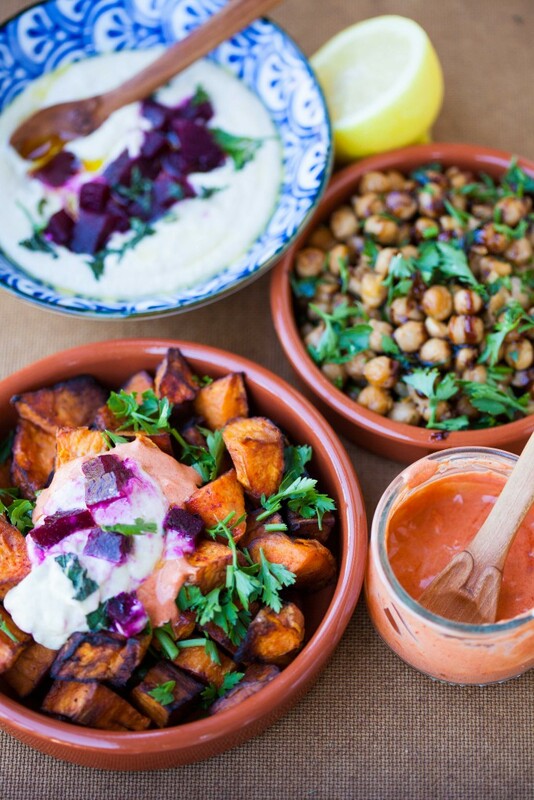 Variations: Roasting the sweet potatoes is a good alternative to pan frying or deep frying. A fried egg or jamon can be added to the patatas bravas as a topping. Alternative dressing as seen below is chickpea hummus with mint and beetroot cubes.